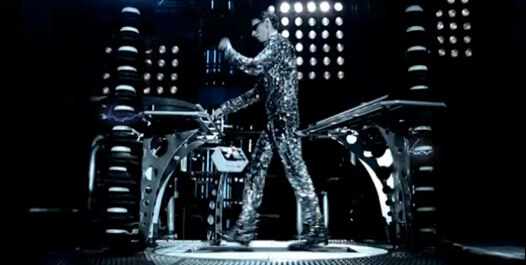 Description: The video is essentially a performance video that shows off the antics Rammstein get up to when playing in concert, some things that can be seen are the CO2 “cannons” from Keine Lust, The Claw shaped flamethrowers from Waidmanns Heil, and for a brief second, the microphone used during Mein Teil. The video itself is just the band performing on the stage used live with sparks flying off parts of it at times. During the breakdown, it has till simply singing/talking into the camera, and during the drum/guitar hits it has the bands head retching all about. Interesting facts: The band would still play the instrumental version song live in Germany until it was ultimately banned from live performances. Rammstein frontman Till Lindermann pierced his cheek for the sole purpose of running a cable through the hole to add LED lighting in his mouth for the band’s new video. Band members advised Till they could hide the wires by shooting from various angles, but Till was determined to do it right.